Today's Draw: King of Cups from the Paulina Tarot. Who is making you hopping mad right now? Can you see that person through the eyes of compassion? Do you find yourself becoming more accepting with age or more set in your ways? Today's question is pretty much the same question I usually ask, though I usually say "today" instead "at this time in life". The question is—What do we all need to know at this time in life? 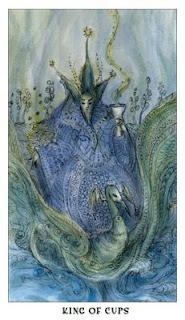 Simply stated, the King of Cups shows up to tell us that we need to be more compassionate and accepting of others. In the wake of the Casey Anthony trial and a number of interpersonal conflicts I've been privy to, I've been shocked not only by some of the things people say and do, but the persistence of some to perpetuate their interpersonal conflicts and spread them to others. And I do want to say that accepting others doesn't mean we have to be friends with them or put ourselves in the path of lunacy, but it does mean approaching others with open hearts and minds, if even from a safe distance. At one time or another, we've all created drama. We've seen others as our enemies. And we've all lived in worlds in which our interpersonal issues become so important to us that we fail to consider what the people we impose them on may or may not be experiencing in their lives. I'm not perfect. I've done all those things and will probably do again. But I've been making a concerted effort not to get involved in this kind of thing anymore. The person I want to be is more easy going, understanding and accepting than I've been in the past. And it's not always easy. Someone recently questioned what kind of person I was for being friendly to someone she doesn't like. I feel like I'm friendly to everyone, even if they're not someone I wouldn't quite label as a "friend". Everyone deserves respect. That's part of being compassionate and accepting. Pressuring someone to make choices in an argument they're not even remotely involved in is not. I have to say, I was shocked my character was coming into question merely for being nice to someone that others don't like. Isn't that a quality we should all have? Kindness to all? Both are people I would consider friendly acquaintances...Facebook friends. It's not like I'm sleeping with my best friend's enemy. Prior to that conversation, I had a lot of compassion for the situation this woman was in. At the end of the conversation, I felt stronger for the other woman, because she's never put me on the spot about who I interact with before. Frankly, I interact with a lot of people who aren't friendly to her and she's never once asked me if she can trust me as a result. It's ironic that the one woman lost an ally simply by pressuring me to state my allegiance. I guess the point I'm trying to make is that there are times we seem so righteous in the things we think and ask of others. There are times we're so caught up in the importance of our own dramas that we don't care who we drag into them and when. I've done this myself. But if we want to be compassionate, caring and accepting people, it goes beyond feeling bad for poor people or having a friend of a different nationality. It requires us to make a deeper inventory of the effect we have on others—as well as the effect we have on ourselves for perpetuating and spreading bad energies to others. I can look back as recently as less than a year ago and regret some of the things I've done myself. What this all gets to, I think, is grace. Showing more grace to others, even those we have conflicts with. Showing more grace in our words and choices. Being more gracious in our assessments of others. Being more gracious in the way we treat ourselves. And yes, even being gracious to people who aren't gracious to us. Fact is, none of us are in a position to judge others. Sure, they may have faults we don't have. We have faults they don't. And conflict and hate and threats and bullying like we've all seen this week doesn't solve anything or add anything to the world. But understanding can. As we consider our life experiences, ask which way is easier? Which way makes us happier? Which causes less stress? And compassion and acceptance will beat out conflict and separation every time.